Why Not? : Lost but not for long! Lost but not for long! My sister likes to get me interesting things for Christmas and I love them. One year it was a chocolate fountain. This year it was a cotton candy machine that uses hard candy to make the fluffy goodness that I love. We busted it open when the family was together at Christmas and it was the hit of the season! Everyone was amazed at how you can make cotton candy out of a Jolly Rancher. After the chaos was over and we packed up to leave, the cotton candy machine made it's way back to Boston. A few months later I'm invited to my good friend Spencer's 4th birthday party and I decided to bring the amazing cotton candy machine. However, when I got it out of the box, the most important part was missing: the extractor! 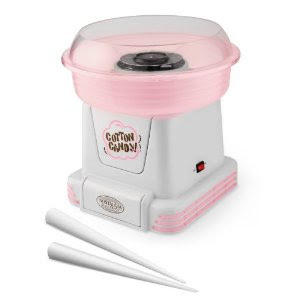 Well, you can have cotton candy with out the extractor so I found that a replacement was $15 and today I ordered a replacement and all will be right with the world again. It's the little things, you know.